Shown (clockwise from top left) are: Andrew Cangemi, Kevin Clyne, Jay Herman and Robert Katz. Herman Katz Cangemi & Clyne LLP (HKCC), a law firm with offices in New York City and Long Island, has a big reach. The firm, which specializes in tax certiorari and condemnation law, represents businesses well beyond its home turf, challenging tax assessments - and more - throughout New York State and across the nation. Its client roster, a who's who of real estate businesses, includes real estate investment trusts, private equity firms, multifamily housing owners, homeowners associations, co-ops and condominium boards, and other commercial real estate owners operating coast to coast. "What distinguishes us is the breadth of our practice," said senior partner Robert Katz. "There are very few firms that are as broad based as ours." Currently, the firm has more than 1,500 active cases in courts throughout New York State. Additionally, the firm is active nationwide, overseeing real estate tax portfolios for REITs and other large investors. Jay Herman and Katz, respected specialists with decades of experience who practiced separately, founded HKCC in 2005 after working together on a substantial case in Ulster County. A prospective client considering new lawyers for a tax challenge contacted each of them independently. The client, unhappy with its previous representation - a trial had resulted in a nominal assessment reduction and a total rejection of the lawyer's valuation expert's approach - then hired the pair who decided to work together to try the complicated case. The property involved a former IBM facility and required 24 separate appraisal reports. At the urging of the court after trial, the town settled the case with more than $7.5 million in savings for the client. 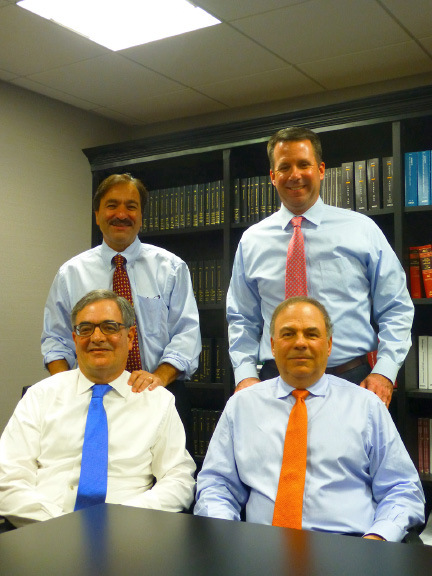 Later, partners Andrew Cangemi and Kevin Clyne joined the founding partners. Aside from their years of experience and the geographic breadth of their practice, it is the firm's creativity in obtaining settlements that satisfy both clients and the municipalities that collect taxes. This is one quality that sets the firm apart from their competitors, the partners said. In a case involving once of the country's largest corporations, for example, Herman said, the company not only obtained $54 million in reduced assessments, but also saved millions in taxes on its 325-acre upstate New York campus. The company also obtained a long-term PILOT agreement with the County Industrial Development Authority that brought tax stability to the company and to the various taxing authorities, and ended years of protracted, contentious litigation. That's what can happen when a firm's four partners have more than 110 years of combined experience in property tax law. Katz and Herman, friends since early in their careers in the office of the New York City Corp. Counsel in the 1970s, have acquired a certain amount of gravitas among their peers and in the courts. Indeed senior partner Herman recently became a member of The Counselors of Real Estate, a pre-eminent invitation-only organization for real estate advisors. A frequent speaker at national real estate conferences, he often lectures on tax certiorari and condemnation issues to bar and assessor associations as well as to business leaders, homeowners, and other property tax attorneys, consultants, and appraisers. His experience - he began practicing law in 1977 - includes work as an assistant county attorney and a deputy county attorney in the office of the county attorney of Nassau County, Tax Certiorari and Condemnation Bureau. He also was an assistant corporation counsel for the law department of the city of New York in the Income and Excise and the Tax Certiorari Departments. Prior to forming HKCC, he was a partner at several major Long Island law firms. Katz, a graduate of the University of Pennsylvania Law School, has practiced exclusively in the area of real property tax since 1978. He ran his own firm prior to joining with Herman. His clients own or manage more than 7,500 hotel rooms, 250,000 residential units, and millions and millions of s/f of office and regional shopping malls nationwide. A vice president and director of the New York City Real Estate Tax Bar Association, he frequently lectures on valuation issues across the country. Partner Cangemi learned the nuances of real estate litigation from the ground up, beginning his now-30-year-plus career in the Nassau County attorney's office where he developed skills in property valuation. Since then, he has navigated almost every conceivable issue concerning property valuation and has extensive trial experience involving complicated real estate. His practice now extends to zoning and land use. He chairs the Village of Northport Board of Zoning Appeals and frequently lectures for both the Nassau and Suffolk County Bar Associations. Clyne was a 2012 addition to Long Island Business News' Top 40-under-40 in Business list. In more than a decade of legal practice he has successfully prosecuted the valuation of diverse commercial properties types. Significantly, he has recently won decisions involving several big box retail cases in upstate New York utilizing a valuation methodology of first impression in New York for this type of property. Assessment challenges for properties with an inherent business value over and above the value of the real estate, such as many self-storage facilities, drug stores, hotels, and assisted living facilities, have become prevalent in New York. "They are businesses and we work hard to prove that the business portion of the operation must be excluded since only the real estate should be valued for tax purposes," Herman said. Being at the forefront of innovative valuation methodologies is something the members of the firm are very comfortable with. For instance, prominent among the firm's clients are country clubs. "We've handled a number of successful litigations involving the valuations of country clubs," said Herman, noting that disputes have arisen over how to value these large properties, often because of their prime residential land. "There never really was a concrete way to value them until Andy and I were involved in the valuation trial of a Long Island country club in the early 90's. Now, while the new methodology is widely accepted, we still have municipalities attempting to challenge a club's value for assessment purposes." HKCC's diverse client roster gives it the ability to address challenging valuation issues. "We have successfully handled virtually every property type," said Katz. The firm's clients seek them out for more than just tax challenges. For instance, the firm has a significant property condemnation practice as well. In these cases, the firm seeks to maximize property valuations since the owner only gets "one bite at the apple" to be compensated for their loss, and "the legal valuation standard is different than in a tax case," said Cangemi. A major part of the firm's practice in recent years is providing tax projections utilized in acquisitions or new development projects. This is critical for the firm's national clients entering the New York market. The firm will also perform analysis and negotiate payments in lieu of taxes (PILOTs) when a client is financing a project through local economic or industrial development agency (IDA) bonds. Dealing with municipalities on tax matters is often complicated by a client's other interests within the locality, eg: zoning approvals. "Representing a client in these matters can be more complicated than just the tax case," said Clyne. The firm always makes sure to think globally and is cognizant of all facets of a client's needs.